My oldest son has read this series several times and I finally made time to read it as well. It was fun discussing each one together, or having him ask me where I was in the book as I was reading it. Shared bookish experiences strengthen not only your bond as parent/child, but also their love of reading. This series is definitely geared toward the older end of the middle graders. I would put the age range at 8-12. 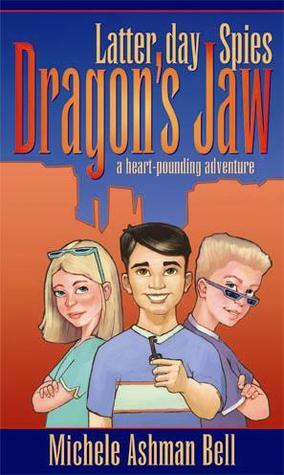 The main characters are 11 years old, but I think even young teens might enjoy them. For more sensitive readers I would hold off until 10 or older. There are some intense scenes in each book. In fact, my son said if he starts reading one of them at night, he has to read all the way to the end, otherwise it gives him nightmares. (He is 9 years old.) So take that into consideration. 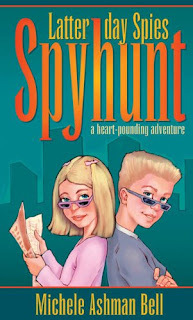 As the name of the series implies, the main characters are Latter-day Saints, or Mormons. It doesn't come up very much or in detail. However, in all 3 books, the kids talk about prayer and answers to prayer, which I appreciated. They pray for help in the frightening situations they find themselves in. I thought the religious element was woven in well, without sticking out or giving the feeling that you were being preached at. 4 stars: A thriller for kids. Seth and Sadie Fletcher, 11 year old twins, live in Frankfurt, Germany with their parents. Their dad is an U.S. Ambassador there. Their favorite game is called Spyhunt. They play it all over town. One team is the spies and the other is the hunters. They pick a landmark and try to reach it without the other team catching them. Their summer is going swell, though a bit curtailed due to their parents' overprotectiveness, when they find out that the son of one of their friends is coming to live with them for awhile. His name is Fami, and he is blind. His dad was killed by lightning--the same strike that caused Fami's blindness--and his mother has something else going on and needs a safe place for him to stay. The twins are not too excited by this news, but rather grudgingly make room in their plans for Fami. When he comes, they're surprised by how normal and cool he is. However, several things don't really add up. For one thing, the story his mom told their parents is much different the story she told Fami about why he was going to the Fletchers'. Also, a menacing man with piercing black eyes has started showing up more and more, almost like he's following them. When things take a turn for the worse, they 3 kids are going to have to rely on each other, and the power of prayer to get them through. The relationship between the twins was well-done and realistic. They loved each other and had each other's back when the chips are down, but day-to-day they also teased and annoyed each other. Fami and his mystical rat helped keep things lively and gave a refreshingly different perspective on the events going on. Some heart-pounding moments were mixed well with lighter fare to keep things exciting but not too terrifying. Content: Some violence, some intense scenes, as noted above. 4 stars: Strong sequel brings back our favorite characters and some of the villains too. After the events of the first book, Fami, Seth, and Sadie are happy to be taking a trip back to the United States to get away from it all for awhile. Their cook is even coming with them, even though she is terrified of airplanes. They are thrilled when they find out that in New York they have an entire floor for just their family--for security purposes. They start playing hide and seek, but after a frightening experience in the hotel elevator, Mr. and Mrs. Fletcher decide their hotel is not as safe as they thought. The kids are sent to Fami's grandfather's cabin in the mountains of Utah. Meanwhile, Fami keeps having dreams about his dad trying to tell him some kind of message before his death. Before long it becomes apparent that their location may have been compromised even there, so they all go into an even more remote place to camp. If your kids liked the first, they will probably like this one too. The twins' friendship with Fami continued to develop, and this one had an added element of mystery surrounding a cave and the message from Fami's dream. Content: Again, some violence, some intense situations. 3 stars: Still good, but I liked the first 2 better. Now the kids are back in London, at an official spy training school--since they seem to need it. Soon after that is complete, they are sent off to Brazil. Maybe it's the training, but it seems like they're seeing suspicious characters all over the place! Once they arrive, they find out that tensions are running high between the villagers they're staying with and some land developers. The kids get the feeling that no-one is telling the full story, but they're not sure who to trust. As things come to a head, the kids will have to use all the skills they have learned. 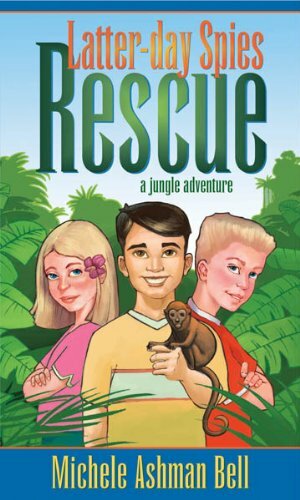 Their survival, and the survival of their new friends depends on it! p.s. Be ready for some surprises! This one veered away from the "kids getting chased by bad guys" formula that was quite successful in the first two. Helping the villagers prevail against the avaricious land developers was good, but not nearly as exciting to read about as the others. Content: I would say this one had the fewest intense scenes. If you and or your kids pick these up, I would love to hear your thoughts! They're a bit older, so they might be hard to find. Amazon has them in its used book store, or just $1.99 for Kindle. Ours were courtesy of a garage sale.